One day, one change: Add modern, rustic style to a boring bedroom wall with this sleek, simple chevron design. A wood accent wall was just the solution to add a rustic, modern touch in this Spanish-style home. In one afternoon and on a budget of $1,000 I recruited Thad Mills, a local carpenter, to help me enhance this space by adding a clean and dramatic bedroom backdrop with gray Stikwood paneling. Measure both the height and the width of your wall in inches. Then map out a pattern you’d like to use. The possibilities are endless, but it is massively helpful to plan out the design ahead of time. We followed a single chevron layout. You’ll need a clean, smooth wall to start. Before applying the Stikwood, scrape any excess paint or wallpaper that could prevent panels from adhering evenly. The surface must be flat, so remove any screws, nails or wall plates extending from the wall. 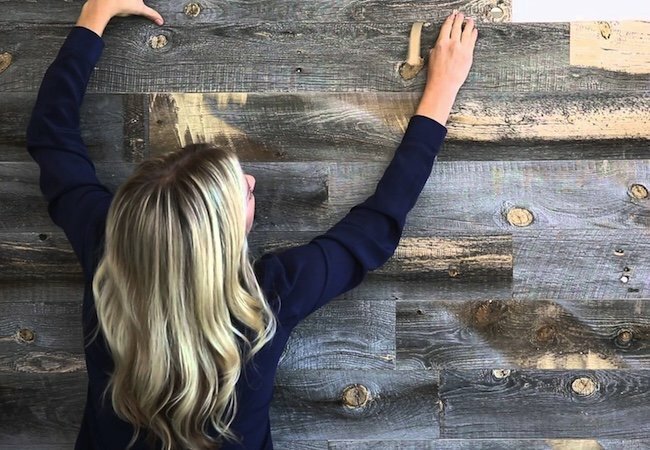 To determine how much Stikwood to order, multiply the height by the width and divide the sum by 144 to find out how many square feet you will need. Order 10 percent extra in order to compensate for a complicated design, bad cuts and/or any nicks or discolorations in the wood. Stikwood is sold in boxes of 10 or 40 square feet. You’ve heard the phrase measure twice, cut once. Well, in this case, you’ll want to measure three times before drawing your reference line. Draw a reference line across your wall in pencil. Depending on the pattern you’ve chosen, draw one very straight line either vertically or horizontally across the entire wall. For a single chevron, draw one vertical line down the dead center of your wall. This will be the point where you will start the application and around which you will base the position of all of the planks. Measure and cut boards with a utility knife. For the single chevron design, make a series of cuts using a speed square to form a 45-degree angle along the middle line, and along all the edges where the boards met at the walls and ceiling. The cutting isn’t difficult, but if the prospect of making diagonal cuts is intimidating, keep in mind that these planks look amazing installed horizontally and vertically too, without all the extra cutting. Peel and install the boards that will be in direct contact with your reference line. Once you’ve created a solid reference point, work out from this established row in order to space your Stikwood correctly. Continue until your design is complete. The last pieces in the corners can be a bit tricky, so it’s helpful to have a bit of excess in order to make a few practice cuts.